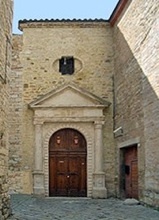 The Oratorio di San Francesco belonged to the Confraternita di San Francesco, which was first documented in 1320. The decision to build an adjacent hospice was taken in 1329. The original oratory was rebuilt in the 16th century although parts of the original portal (below) were preserved. This confraternity had close links throughout its history with the Confraternita di San Domenico (first documented in 1318) the Confraternita di Sant’ Agostino (founded in 1317). The city statute of 1320 relating to the procession on the feast of St Herculanus listed all three among the confraternities taking part. Like other confraternities in the city, all three were engaged in charitable activities, which included the care of the sick, the support of the poor, and the assistance of pilgrims, and they also took part in the civic and religious processions held in the city. Although the three confraternities were closely associated, each had its own administrative structure and its own oratory. They adopted a common constitution from at least 1472, and this was reformed on a number of occasions from 1520 until 1824. The constitution of 1472 is entitled: “Liber Fraternitatis Domini Nostri Yhesu Christi generalis videlicet Sancti Agostini Sancti Francisci & Sancti Dominici” (Book of the Fraternity of Our Lord Jesus Christ, generally known as SS Agostino, Francesco e Domenico). The preamble to the reformed version of 1824 explains that the three confraternities had been among the numerous associations known as Disciplinati di Gesù Cristo that had been inspired by Raniero Fasani in ca. 1260. The three confraternities consistently opposed episcopal interference in their affairs, and secured the explicit confirmation of their independence from Pope Urban VIII in 1632. They were suppressed during the French occupation (in 1799-1800 and in 1809-14) but continued to play a prominent role in the city thereafter. For example, they distributed funds to the patriots who suffered in the papal invasion of Perugia on 20th June 1859. The three confraternities were united as the Sodalizio Braccio Fortebraccio. in 1904. As noted above, part of the portal dates to the 13th century. The relief on its architrave depicts the column at which Christ was scourged, which is an appropriate iconography for a penitential confraternity. The vestibule is decorated with stucco work (1675-6) by Jean Regnaud de Champagne (in Italian, Giovanni di Sciampagna). 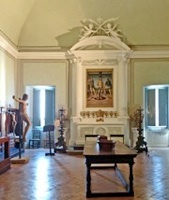 The interior decoration provides a good example of the early Baroque in Perugia. The doors to each side of the altar lead to the sacristy. The confraternity commissioned Ercole di Tommaso to gild the ceiling in 1573. He seems to have let them down, and they were forced to pay Fiorenzo di Giuliano to complete the work in 1600. The work was complete by 1624, but a dispute between the confraternity and the artist delayed the final payment. This dispute was resolved through the arbitration of Bishop Cardinal Cosimo de Torres: he essentially found in favour of Giovanni Antonio Scaramuccia, provided that he repainted the last panel. This he duly did in 1627. These panels by Bernardino Gagliardi are on the back wall. 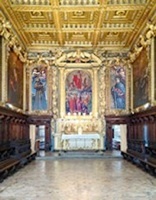 The altarpiece on the main altar, which depicts the Risen Christ with the Virgin, St Peter and other saints, is by Leonardo Cungi. These panels to the sides of the altar are by Paolo Gismondi. The doors on the altar wall of the oratory lead to the sacristy. This gonfalon now forms the altarpiece on the altar in the sacristy . It is almost certainly the work of Pietro di Galeotto, who received payments from the Confraternita di San Francesco for a processional banner. A banner depicting Christ tied to a column was documented in 1486 on an altar in the oratory. The banner depicts Christ tied to a column, with His skin chafed by ropes around His arms and by the crown of thorns. Two thugs, partly stripped for the work, participate in His humiliation, which takes place in an open loggia that is bathed with early morning light. The realism of the brutality and the accurate perspective of the setting are both important characteristics of the work. The Flagellation was obviously an appropriate subject for this penitential confraternity. These two panels, which are attributed to the Maestro di Paciano, , were recorded in the sacristy in the 19th century and passed to the Galleria Nazionale in 1869. They probably formed the outer panels of a triptych. The iconography of the narrative scenes depends upon that of frescoes (ca. 1320) in the south transept of the lower church of San Francesco, Assisi. This suggests that the triptych was commissioned in the early 1320s, soon after the formation of the Confraternita di San Francesco. It might have been the altarpiece listed in an inventory of its possessions that was made in 1326. The presence of both Franciscan and Dominican saints in the panels suggests that the association between the respective confraternities (mentioned above) was forged from their inception. 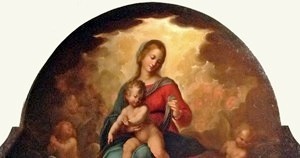 This lunette-shaped panel, which depicts depicts the seated Madonna and Child with two putti, was documented in the sacristy, with an attribution to Giovanni Antonio Scaramuccia, in 1784. It is thought to be Scaramuccia’s earliest surviving work. It is now in the Museo Capitolare.